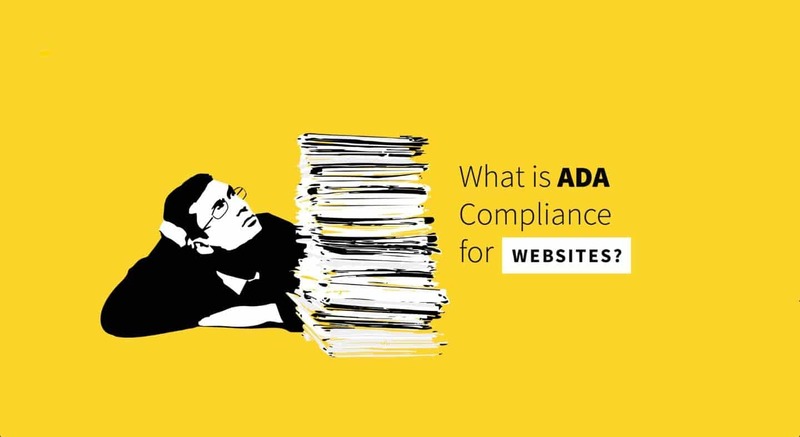 Is ADA Website Compliance Important? The Americans with Disabilities Act, or ADA, was created by congress as a supplement the Civil Rights Act of 1964, which outlawed discrimination based on race, color, religion, gender or national origin. The ADA was created to protect individuals with disabilities from discrimination and to ensure accessibility. In the real world, this applies to the physical accommodation to businesses as building construction and alterations must comply with ADA design standards. While most of us are familiar with these requirements, many of us might be surprised to learn that the same standards apply to the digital world, in particular websites. The standards are to ensure that people with disabilities are able to access content to a website with the same convenience as people without disabilities. As a business, government agency or non-profit organization, you are compelled by the law to remove any technical obstructions that may discriminate against people with disabilities. Failure to comply with ADA design standards may result in fines or even a lawsuit. Do I have your attention now? 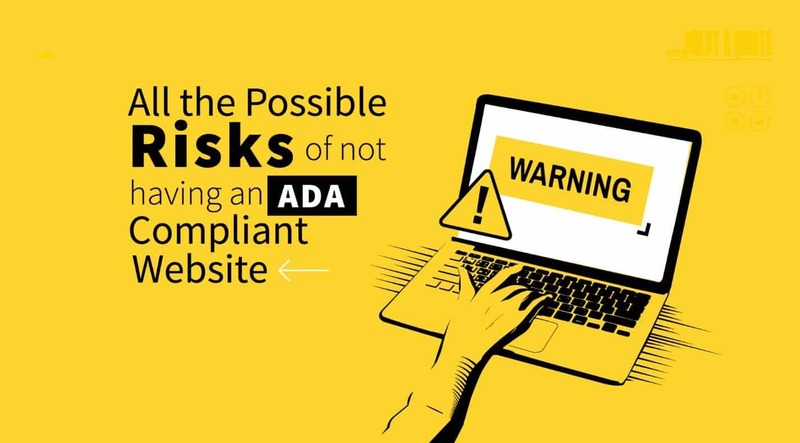 In 2019, ADA compliance should be considered a priority when building a website. 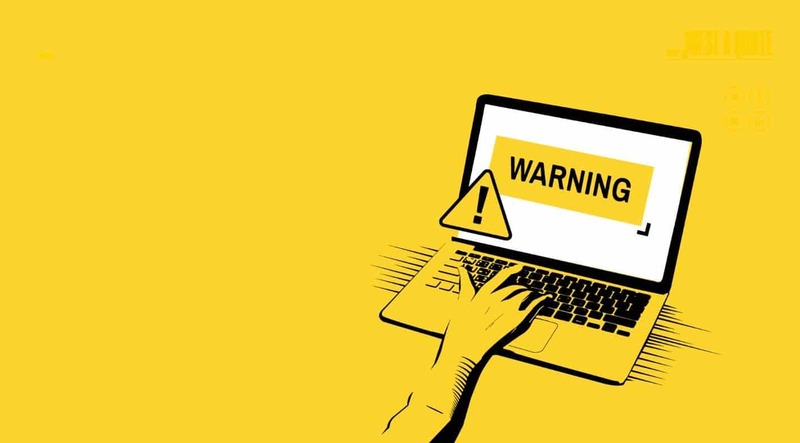 With the emergence of the World Wide Web in the late 90’s and early 2000’s, it became apparent that website standards were not compliant with ADA standards. The user experience for people with disabilities was frustrating and unwelcoming. Lawmakers acted to extend the protection of people with disabilities to include “goods, services, facilities, privileges, accommodations, or advantages offered by public accommodations via the Internet.” During this time, the World Wide Web Consortium, or W3C, an international community that develops open standards to ensure the long-term growth of the Web, began to take root. 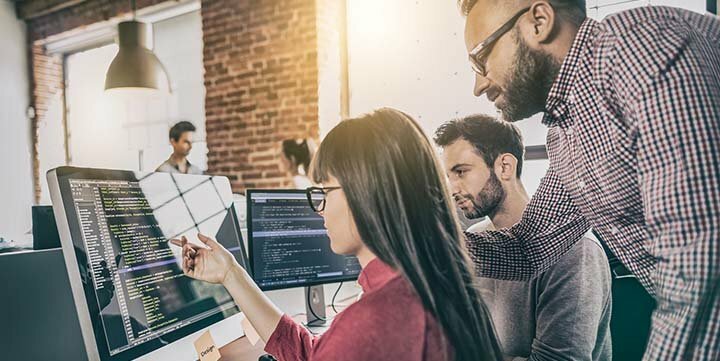 W3C standards were created in a cooperative with academic institutions, businesses and government agencies in an effort to ensure that WWW does not stand for Wild, Wild West. Unified standards makes life easier for everyone and ensures a more consistent online experience. The standards created by the W3C and the aims of the ADA made good bed fellows. Soon, Section 508, an amendment to the United States Workforce Rehabilitation Act of 1973, adopted W3C compliance standards, mandating that all electronic and information technology developed, procured, maintained, or used by the federal government be accessible to people with disabilities. Confused? Don’t be. Whether it’s the ADA, Section 508, or W3C-compliance standards, when building a website all you need to concern yourself with is to ensure that it is fully accessible to all people. The W3C established the Web Content Accessibility Guidelines, or the WCAG(v2), a shared set of guidelines, “with the goal of providing a single shared standard for web content accessibility that meets the needs of individuals, organizations, and governments internationally.” WCAG2 was designed specifically for web developers and compels them to comply. Under this guidance, there are three levels of conformance defined as: A (lowest), AA, and AAA (highest). Depending on the nature of your organization, these levels will indicate to the government that you are either under compliance or begging for a discrimination lawsuit. In 2017, the Department of Justice passed official guidelines on website accessibility standards to be in line with AA requirements. This is why its is so important that when you work with a web design agency that they comply with the WCAG. Provide text alternatives to non-text content such as buttons, input fields, charts, graphics, images, and anything else that is vital to the user’s experience. Add captions for videos, recorded audio and livestreams or broadcasts, clearly labeling alternative text, and providing sign language interpretations for various types of media. Make your website accessible by keyboard, so that persons with disabilities can use the “Tab” command to shift from field to field, instead of operating the cursor using a mouse or a touch pad. Make the site as easy to navigate as possible by using clear indicators such as large-font text for buttons and controls, clearly labeling headers and menu options, and keeping content logically organized. Avoid bright flashing graphics and audio-visual content with a fast montage to prevent potential seizures. Provide users with enough time to navigate the website. This means no flashing instructions or input fields that disappear after a short period of time. Use the correct language attribute in their HTML code, so the page loads with the most commonly used language. This also applies to alternative text for images, videos, text-to-speech synthesizers and other multi-media content. Close captioning on videos in crucial, especially for the deaf community. PDF documents need to be properly tagged so that screen readers can properly interpret non-HTML content. Adherence to web development best standards will ensure that content displays properly for all users. As awareness of the need to create websites that are accessible to people with disabilities, if not for better customer experience than to protect against potential lawsuits, the term “ADA Compliant” has become a marketing term for web design agencies. Do not buy into it hook, line and stinker. As Ronald Reagan once stated, “Trust, but verify”. To ensure that your website is ADA compliant, DEEPBLUE provides a comprehensive audit to ensure that it meets minimal ADA requirements as defined by the government for your industry. Federal and state agencies have the highest standards, followed by large, public corporations. However, if you run a small-to-midsize business don’t believe that you are flying under the radar. 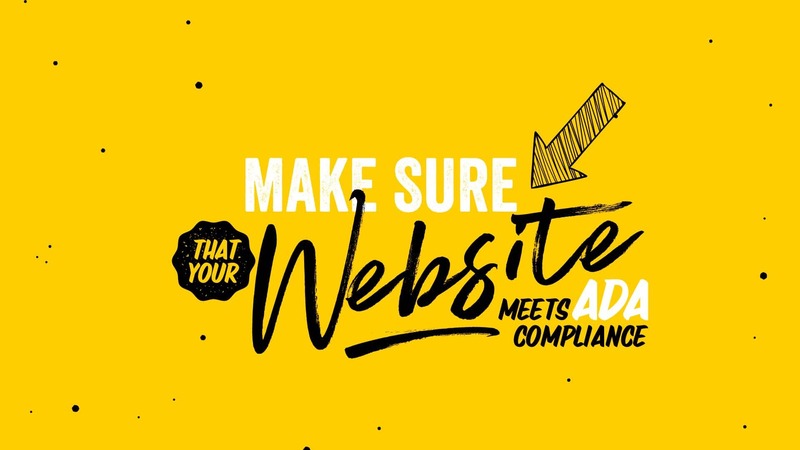 ADA compliance should be considered a best practice in web design and it will give you the piece of mind that you are safe from potential litigation while ensuring that you provide the best possible user experience for your customers. If you are concerned about ADA compliance please contact us today for a complementary assessment. Anna Oderinde is a project manager at DEEPBLUE. DEEPBLUE has been nominated as a prestigious “Site of the Day” at Awwwards.com and we need your support. Click here to vote today! Awwwards is a professional web design and development competition body. It aims to recognize and promote the best of innovative web design. The best year-round submissions are awarded at the Awwwards conference and prize-giving ceremony, which take place in various cities across the United States and Europe. Awwwards was founded in 2009, and is headquartered in Valencia, Spain. DEEPBLUE is a full-service, custom web design agency that specializes in creating an entirely new user experience through responsive design, placing an equal imperative on both desktop and mobile devices. They create impactful multi-platform solutions for meaningful brands. DEEPBLUE offers a suite of creative services to improve the online visibility and impact of your business. Their capabilities range from custom websites with responsive design and robust CMS solutions to branding and marketing campaigns, all with a deep focus on the user experience. They succeed in providing their customers with a unique and engaging multi-platform experience. Based in California’s majestic central coast, DEEPBLUE’s clients range from small business to Fortune 500, from start-ups to 100-year-old stalwarts, from non-profits to government agencies. Frank Farris is Founder and CEO of DEEPBLUE. He has been an active thought leader in the application of emerging web technologies since 1998 and is a champion of the movement to make the Responsive Web Design approach the new industry standard. Cision PRWeb, a national news publication, has named DEEPBLUE as a Top 25 creative agency in America. Lets face it, non-profits and technology don’t always make for good bedfellows. Non-profits face many challenges, from keeping the lights on, fundraisers, donor and member relations and bureaucratic squabbling, that tend to occupy much of the bandwidth. However, there are other nuances that lead to predictable outcomes. Non-profit organizations are comprised of idealists; folks that are out to change the world for the better. These people have often spent years compiling degrees, writing dissertations and sometimes traveling to the farthest outposts of the globe to care for people or creatures in need. A noble endeavor, indeed. However, the concept of marketing can seem like a foreign notion, as non-profits seek to make a difference without shining the spotlight. It can be culturally ingrained that promotion is somehow a thing to avoid, as if the attempt in doing compromises the integrity of the cause. This is unfortunate, as minimizing the message diminishes the impact. Non-profits should embrace technology, and the most impactful and cost-effective way to do so is through the proper use of web technologies. Promote your organization online to deliver your message. According to the National Center for Charitable Statistics (NCCS), more than 1.5 million nonprofit organizations are registered in the U.S. That is a very crowded room, and unless you can effectively communicate your organization’s message and purpose, you stand a real chance that you will get drowned out in all the chatter. Just as with anything in life, we can’t all be the Melinda and Bill Gates Foundation or the Susan G Komen Foundation. We can’t assume that people know who we are or what we are trying to do. This is a critical task for your website, and it needs to be clear and simple. The website needs to tell your story. It needs to elicit an emotional response from site visitors. It needs to drive them to take action. Social media is an ideal platform for non-profit organizations invest. According to Brandwatch, the average daily time spent on social is 116 minutes a day. This is an engaging and captive audience that loves to share engaging, emotional stories with their friends, family and co-workers. Non-profit organizations need to create unique content that catches the attention of your social audience, and if your’re lucky some of them might even go viral. Interesting videos, fundraisers, personal stories, etc. A few years ago we created a Facebook ad for the Tennessee Aquarium that had a humorous approach. The observer was asked to guess how many fish were in a picture and post their answer. As the viewer strained to count the fish the image suddenly morphed into a great white shark attacking the screen. It had a simple shock value to it and was shared by over 10,000 people. Simple campaign, effective results. Fundraising is the lifeblood of any non-profit organization. Your non-profit web design needs to be your most compelling fundraising vehicle, and don’t play coy. An effective online fundraising strategy is aggressive and visible. Make certain that site visitors are aware of how they can donate at all times. Every page on the website should have a “Donate Now” button. The website should drive the user to all different types of fundraising options, including online donation, attend a fundraiser, membership, sponsorship, gift honor, merchandise, etc. One great platform we highly recommend is Network For Good (www.networkforgood.com), which offers a variety of fundraising services to help even the smallest non-profit organization become a fundraising rockstar. Regardless of your online fundraising strategies, make them as simple as possible and incentivize your audience to take action through effective storytelling. With all the talk of fake news these days it is important to know that the press is still the best way to get your message out to the largest possible target audience. Make sure that all of your site updates are submitted to media channels, some of them might pick them up for mass coverage. Install a news aggregator on your website. Create a mailing list for breaking news blasts and make certain to ask your site visitors to subscribe. Update your blog weekly. Push all your press releases out to social media. Create a media kit for journalists to download. Provide a contact name and information on your website so that the press can reach you for comment. Get to know your local journalists. Not everyone can make financial contributions to your organization, but they would still like to help. Use your non-profit web design as a platform to encourage volunteering at a local level. Provide a volunteer kit that anyone can download and follow to organize local charity drives that promotes your message and fundraising. Have contests that recognizes local heroes that are making a difference. Feature them on your website, give them an opportunity to tell their story and why they are so impassioned about your organization. Show pictures and videos of folks wearing your gear and engaging in the community. This generates buzz, excitement, goodwill and results. 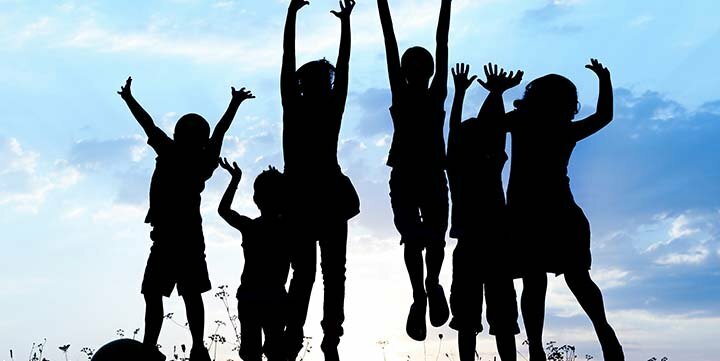 Non-profit web design strategies can be highly effective. We strongly recommend that non-profit organizations embrace a web marketing strategy that revolves around their website. Invest in a strong web presence by a professional web design agency that specializes in non-profits and properly reflects your organization’s purpose, culture and values. Keep your website current and active with new blog posts and press releases. Turn your website into a fundraising machine. Engage social media. Connect with journalists. Encourage grassroot activities. We are recognized as a top California Web Design Agency on DesignRush. Although web design best practices have evolved over the years, some things have not. In this article we will discuss the 6 web design best practices that your web design agency should know. Your web design agency does not need to know how to modify your software architecture, increase efficiencies in your manufacturing process or develop new service lines. However, your web design agency does need to understand your business fundamentals: who you are, your core values, what you do, who you do it for and how you differentiate yourself from your competition. Your web design agency should also understand your culture. A tech startup in San Francisco, for example, will have a vastly different culture than a manufacturer in Waco, Texas. As mentioned above, your web design agency needs to know your target audience. Most organizations have multiple audiences, so your web design agency needs to know how to structure your website architecture to cater to each specific audience. They say on the web that content is king, and this is true. But content left unchecked can quickly become a vast wasteland of dead, scrolling pages that customers will either ignore or become so frustrated with that they leave the website. Whether your new website is using repurposed content or you are creating fresh content, it needs to be well organized. Information architecture is the process in which your web design agency will effectively organize your content. This includes creating navigation schemas, page wireframes and search systems that will provide the blueprint for a well organized website. Content defines information architecture, information architecture defines design, design defines how successful your new website will be in the eyes of your customer. I describe information architecture as the UI (user interface) and design as the UX (user experience). The design of your website will represent you in the most practical sense, and it needs to be a true representative of your business. Your web design agency should create a custom design based on collaboration and focused on UX on both desktop and mobile views. The process of building a website that adapts itself according to screen size and device is called responsive web design, which is an absolute standard in 2018. If your web design agency does not use responsive web design on its own site or client examples run away. Don’t look back, just run away. A good tool to test for responsive web design can be found at Responsinator: https://www.responsinator.com/. Your web design agency should build your website using a content management system, or CMS, that is intuitive, robust, scalable, flexible and open source (non proprietary). WordPress is the most popular open source CMS in the world and is our recommended CMS of choice. With WordPress, you get all of the advantages of using a content management system without any of the drawbacks, including ease of use for non-programmers, a large online community of add-on developers, security and perhaps most importantly for small business owners, no license fees. If your web design agency is pushing you towards a licensed platform ask them how it has any advantage over WordPress in regards to these factors. Calls to action are the most important psychological drivers on your website. They drive users to desirable outcomes you have already identified during the planning stages of your website. Your web design agency should work with you to help determine the calls to action and make certain that they take priority in the overall flow and structure of your website. Calls to action can include filling out a request form, signing up for a newsletter, register as a customer, make a purchase or join your social networks. The flow of the website in regards to calls to action should be designed during the information architecture and design phase of the project. All calls to action should be measurable via analytics. Web standards are invisible, but critical to the overall success of your website. Web standards ensure that with compliance your website will be optimized for search engine optimization (SEO), cross browser compatibility, mobile device compatibility, site performance and accessibility. The most popular web standards are the World Wide Web Consortium (W3C), the “Living Standard” created by the Web Hypertext Application Technology Working Group (WHATWG) and ADA government standards for accessibility compliance. To test your website for W3C compliance go to https://validator.w3.org/. Ask your web design agency about web standards. Have them place a web standards compliance guarantee in their service and maintenance agreements. This list of web design best practices is just the tip of the iceberg and I will be adding more components in more blogs to come. The purpose of this article is to help you determine which web design agency is best for you. Afterall, you are the last word on whether or not it fails or succeeds. We are recognized as a top E-Commerce Design & Development Company on DesignRush. It’s that time of year again when we in the web design industry look back on the previous year and marvel at all the breakthroughs that occurred while looking forward with Nostradamus-like accuracy to all the predictions, trends, buzz and ill-guided persuasion attempts the new year will bring to web design best practices. I’ve come to view my annual article about web design trends as obligatory as my New Year’s resolutions, which never last past February. Anyway, 2018 was a good year for steady evolutionary increments in web design, such as the further standardization of responsive web design, chatbots, micro-interactions, asymmetry, tactile design and font personalization. So what can we expect in 2019? Here are 7 trends that you should consider for your website. UX, or User Experience, is a central tenet to all modern web design. I like to define UX by pairing it with UI (User Interface) and then making an analogy that has nothing to do with the web design industry. Let’s consider rental cars. If you are like me and travel constantly from airport to airport you have become very familiar with the exercise of de-boarding, dashing to grab your luggage and making a beeline to the car rental center. Rarely do I get the same type of vehicle twice, and I want my experience to be as painless as possible. I honestly don’t care if I get a compact, a sub-compact, a micro-compact, or a nano-compact as long as it gets me where I need to go. My issue has always been with the damn gas cap as I never seem to be able to find where the button is, whether on the dash, on the door, or (literally) hidden under the seat. Nothing frustrates me more than being stuck at a gas station and crawling through the entire car to find it. I always wonder why the engineers that designed the layout simply could not place the gas cap release some place that would be intuitive for all drivers, especially since these models constitute the majority of car rental fleets. I describe this as a very poor User Interface (UI), and because of this I have an equally poor User Experience (UX). You see, the design interface has a direct impact on the overall experience as a user of a product. Poor UI leads to poor UX. The same applies in web design. Make sure that your site is designed with the customer in mind. Apple started it, and we all followed. Then every website began to look like an Apple wannabe, so we all got away from it. Now it’s back, and not necessarily because Apple is no longer creating innovative products. For good design that translates well for desktop, tablets and smartphones (RWD), use less clutter and more white space. The proper use of white space amplifies the important calls to action on the page that you want your users follow. When it comes to web design, less is certainly more. Do not accept any design that has everything and the kitchen sink thrown into it. This is not expert design but rather an indication of of a designer that is aesthetically-challenged and is attempting to cover up deficiencies by continuing to add more and more to a page. Don’t fall for it. Keep it clean. For those of us old enough to remember when computers used to connect to the Internet using a phone line we can all commiserate with the excruciating experience of watching streaming videos on our CRT screens. Thankfully, those days are long gone as the Web is now a safe place for using video as content for your website. Videos are a fantastic way to tell your story and capture the interest of your target audience in a convenient snippet. More and more, you will see videos replacing static images for the hero section of websites, which is the main focal point of the home page. Using a CMS such as WordPress, it is extremely easy for site administrators to add videos on a daily basis. But make sure that the videos are relevant and of high quality. We recommend working only with reputable video production agencies that will help you craft your story, define your narrative and deliver your message on point. Also, you probably want to set up a premium account on a video platform such as Vimeo or YouTube to ensure that they run ad free. Approximately 1 in 12 men and 1 in 200 women in the world are color blind. They do not care about which colors you choose for your website. The rest of us do. Color evokes emotion. Color defines the tone, theme and attitude of a website, and bold colors used correctly can provide that extra ‘pop’ you need to really grab someone’s attention and pull them in. Eye tracking studies have shown that the proper use and balance of color can make a difference between bounce rates and conversions. Contrasting color within site elements make appropriate callouts more apparent and recognizable, which will help you craft a site that encourages them to take particular actions and more predictive outcomes. Modern computers can display 16,777,216 different colors, so there’s really no excuse to be drab and boring. Steve Jobs loved fonts. He hated the standard suite used for Windows PC’s (Arial, Helvetica, Sans-Serif) and was the first to insist that his Macs gave us a real choice and ability to express ourselves with personality and creativity using fontography. Fonts are a pillar of good web design that is often and shamelessly overlooked. More than anything, fonts establish attitude and individuality. One of the best ways to make your website stand out is to get creative with your use of fonts. Always ask your web designer what fonts they like to use and how they can help you establish a font profile for your website that is fresh and appealing. What a second… did I just write that? For years, I HATED gradients. They were the bane of my very existence. I perceived any use of gradients as a cheap conjuring of poor web design used by designers that simply did not have a clue about good web design philosophy. And worst, they looked HORRIBLE on those older CRT monitors and low quality graphics chips. But as those old menthol ads used to say, You’ve Come a Long Way, Baby. Today, modern chips and screen technologies have the processing power and higher resolution necessary to display gradients as they were initially intended and look fantastic on a website. Gradients provide a subtlety to a design that will allow your colors to shine and your use of fonts to pop. They serve as a conduit from one graphical element to another, allowing your users to transition seamlessly from one section of a page to another. Look for gradients to be a popular choice in 2019. Yes, Responsive Design was a top trend for 2018 and 2017 and 2016 and 2015, etc. Need I say more? Responsive Web Design, which is an approach to designing web pages using fluid-based proportion grids, media queries and scalable images, has completely revolutionized the web design industry. In the era of the mobile web, it is imperative that web design place equal emphasis on desktop, tablet and smartphone devices. Responsive websites are easy to maintain and do not require developing a separate mobile site, plus they are compliant with modern web standards, ensuring browser compatibility and search engine optimization. Do not ever consider working with a web design agency that has not adopted responsive web design as its development standard. This is where I remind you of how important your website is to your brand and marketing strategies and how keeping up with web design trends in 2019 will help you maintain a competitive advantage, yaddi, yaddi, yaddi. Just keep in mind that trends are just that… trends. What’s hot sauce today is cold soup tomorrow, so always approach trends in web design with a modicum of salt. Regardless of how things change with technology and social preference, the fundamentals of marketing remain. Always present yourself with confidence. Antje Knott is the Social Media Manager for DEEPBLUE. She has over 10 years of industry experience as a wordsmith, social media manager, SEO/SEM specialist and digital advertising executive. Typography (n): the style, arrangement, or appearance of printed letters on a page. And perhaps the most important design element of 2018. The purpose of your site is to be read — and what you’re saying matters just as much as how you’re saying it. In 2018, text in web design continues to thrive under the helm of content-first design enthusiasts. We’ve rounded up the typography trends we’re seeing this year, many of which place text front and center — or, all over the page. Let’s take a look at how we are using them. 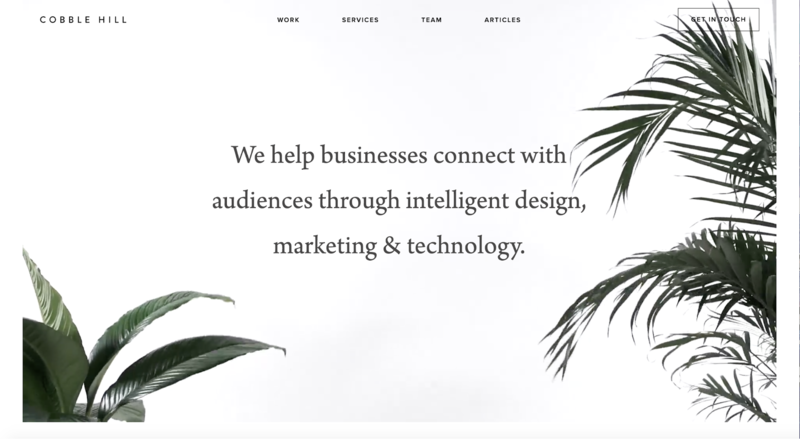 Big, bold, condensed, and unmistakably dramatic text is perhaps the most obvious use of text as a primary web design element. This year, we’re seeing hero images replaced by bold headlines that anchor homepages with brand names or messages. The effect? A site’s typography becomes the site’s design. CreativeDoc, for example, masterfully creates a loud design out of six bold, white letters on a strong black background. Souffl, a European design and innovation company, employs condensed, bold, white text on a black background, then adds character with pops of animated color. Serifs continue their footed rise to the top of the font kingdom since we first nodded to this trend earlier this year. Elegant titles and sophisticated headlines outfitted in popular serif fonts like Calluna and Minion are warding off serif naysayers. So, what are designers doing with their newfound love for … feet? The visual revolution that dominates journalism, among other industries, has yet to tarnish the importance and prominence of text in web design. Now, in 2018, we’re seeing designers embrace words —what Jackson names the “most powerful tool on the web” — in their designs. 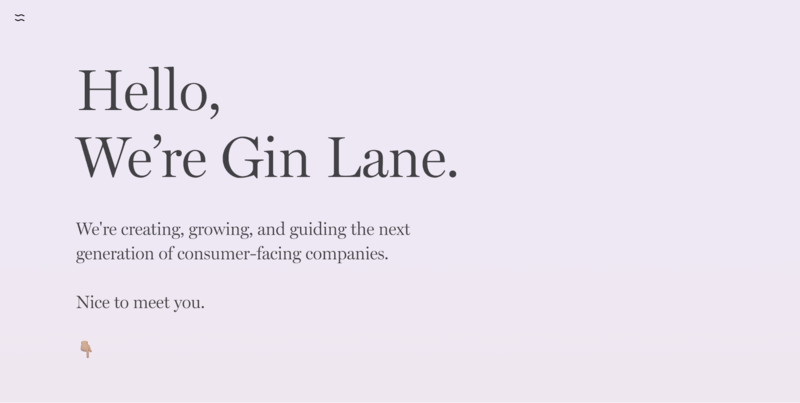 It is no small feat to design a web page exclusively with text. But done well, we don’t even notice the lack of images. How do you measure the success of a site? Conversion. You could have a lot of traffic going to your site, but those visits don’t really matter if you aren’t converting them into customers. The only visitors that matter are those that are adding to your bottom-line. All other traffic is essentially wasted. Are you finding yourself with a lot of traffic, selling the right products at competitive prices, yet not with many paying customers? Then read on to find out why your site isn’t converting and what you can do about it. First things first, you should know your current conversion rate. Whether you measure your conversions by product purchases, brochure downloads or email newsletter signups: you need to be measuring and tracking those conversions regularly. You can track your conversion rate using Goals in Google Analytics or through any other analytics platform of your choosing. So what’s considered a good conversion rate? The ideal rate is between 2 to 3 percent. This rate could be higher or lower based on the value of the conversion (e.g. you’d have more difficulty converting customers if you’re selling products or services worth $10,000+). But if you’re having less than 2 percent conversion and your conversion value isn’t very high, then you might have a problem on your hands. Here are five reasons why your site may be underperforming. If your website isn’t mobile-friendly, there is no way it will survive in these times. It isn’t enough for your site to be responsive, it has to be designed specifically for mobile in terms of content and structure. Failure to do so would mean marginalizing a substantial portion of your customer base and in turn decreasing your conversion rate. But what does designing for mobile entail? The key is to keep testing your mobile site. Perhaps you should even ask customers and family members for feedback on your site’s mobile experience. Afterwards, you should review what is working and what is not – and address those issues. As long as you do not ignore the importance of having a good mobile experience for your site, you can easily hone in on the reason(s) your site is not converting. Your website could be user-friendly with engaging and quality content, but without a clear and concise call-to-action, you simply won’t convert. Users may want to convert but just don’t have the opportunity or means to do so. Because you haven’t provided it. Make your call-to-action clear, concise, prominent, specific and compelling. Provide all the information users need so they know exactly what you want them to do next. Create calls-to-action that are relevant and specific; and place them in a prominent place on every page of your site. Whatever you do, make sure it is very easy for the user to convert when they are ready to. You may be missing out on conversion opportunities if there is something off-putting about your site. Look at your bounce rate: if it is high, then you know there is something that is not appealing to users. In such a case, you need to find out what the problem is – directly from the user. You may use heat maps and look at your user journeys via Google Analytics, but perhaps it will make your job easier to ask users directly (e.g. via a quick survey). These are all problems with a rather easy fix. Take your time investigating them and fix the errors as soon as you can. Your website should be anything but general. A lot of website owners aim to please everyone – but they can’t – and end up isolating their entire audience. Perhaps you’re writing for the wrong audience, perhaps you’re writing for a larger demographic than you should be; whatever the case, inaccurate targeting could negatively impact your conversion rate. Your copy, branding, marketing and site design should speak directly to a niche demographic. Conduct market research to properly define and know your audience. When your website doesn’t load fast, your visitors leave and are unlikely to visit again in the near future. If your site is taking longer than 3 seconds to load, you need to work on it. Studies show that most users quickly exit sites that take longer than 3 seconds to load. This is actually a sixth reason why your site may not be converting. Measure, measure and keep measuring. If you’re not measuring, you’re guessing, and in turn, not really making any strides. The problem most website owners encounter is that they are either not tracking their website traffic or that they are tracking but not reviewing their metrics. Some do know they should be tracking, but just aren’t sure what to look for or what to make of the results. Well, you should always start with your goals in mind. Then you can identify which key metrics will help you to measure your progress towards those goals. Once you start measuring, you can improve on those metrics; figure out what is working, what isn’t, and then fine-tune and optimize. These five reasons are just a starting point to help boost your conversion rates. There are many other reasons why your site may not be converting. However, these are fairly common in under-converting sites. If you find that any of these reasons apply to your business, simply make the changes and you’ll see a big difference or improvement in your conversion rates and bottom line. It’s that time of year again when we in the web design industry look back on the previous year and marvel at all the breakthroughs that occurred while looking forward with Nostradamus-like accuracy to all the predictions, trends, buzz and ill-guided persuasion attempts the new year will bring to web design best practices. I’ve come to view my annual article about web design trends as obligatory as my New Year’s resolutions, which never last past February. Anyway, 2018 was a good year for steady evolutionary increments in web design, such as the further standardization of responsive web design, chatbots, microinteractions, asymmetry, tactile design and font personalization. So what can we expect in 2019? Here are 7 trends that you should consider for your website. Wait a second… did I just write that? For years, I HATED gradients. They were the bane of my very existence. I perceived any use of gradients as a cheap conjuring of poor web design used by designers that simply did not have a clue about good web design philosophy. And worst, they looked HORRIBLE on those older CRT monitors and low quality graphics chips. But as those old menthol ads used to say, You’ve Come a Long Way, Baby. Today, modern chips and screen technologies have the processing power and higher resolution necessary to display gradients as they were initially intended and look fantastic on a website. Gradients provide a subtlety to a design that will allow your colors to shine and your use of fonts to pop. They serve as a conduit from one graphical element to another, allowing your users to transition seamlessly from one section of a page to another. Look for gradients to be a popular choice in 2019. Data is everywhere around us, and yet, it is generally difficult for us to comprehend and remember isolated numbers. When put into a story, however, data becomes much more relatable. (The human brain can process images 60,000 times faster than words.) 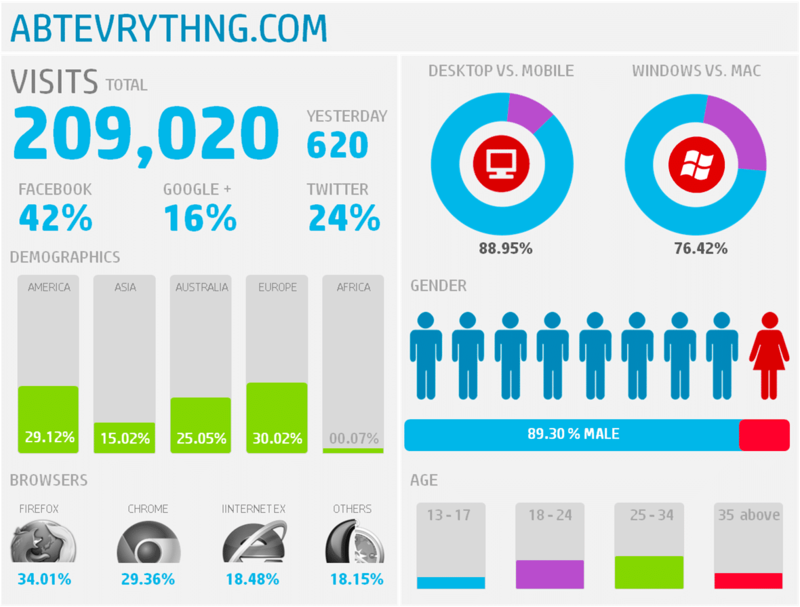 For this reason, infographics have become increasingly popular among marketers around the world. But with this surge in usage, it’s important to make sure your infographic does the job it’s supposed to do: drive traffic, build awareness, and generate leads for your business. Below we’ve compiled some of the best tips for creating effective infographics to help your brand devise a strategy that resonates with your audience. 1) DO: Keep it simple and to the point. Try to break down your message into one, strong sentence. From here, you can use data to support what you’re trying to say. But remember: Less is more. This simple chart tells a big story. 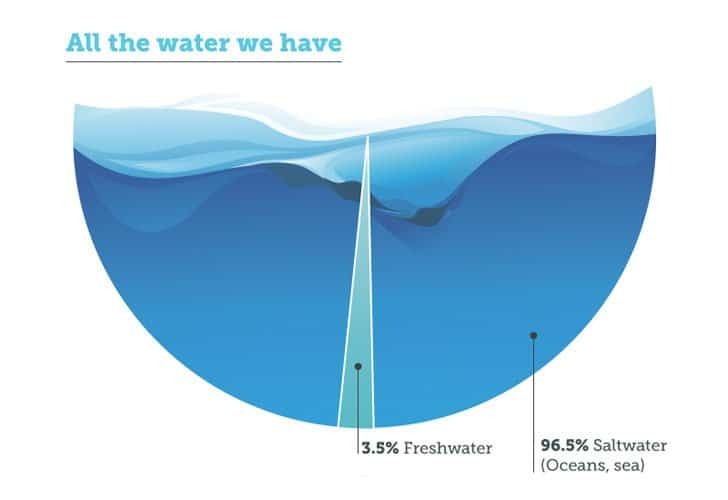 Thanks to the contrasting colors, it easy for the reader to immediately understand just how scarce fresh water is. This is an approach you’ll want to make note of if you want your readers to focus on a specific data point. 2) DON’T: Try to say too much with one chart. 3) DO: Surprise the reader with an unexpected twist. Have some unusual information on your hands? Use surprise as a means of increasing alertness and focus. 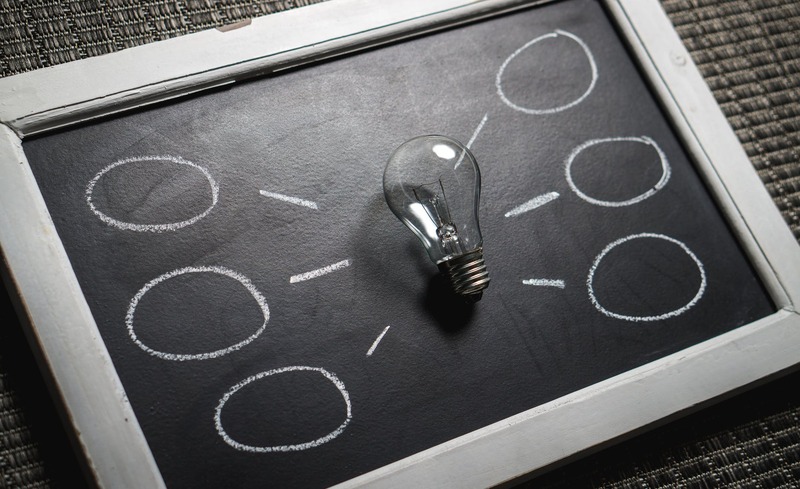 If you can make the reader question their previous beliefs, open their minds to new ideas, and then fill the gap with your information, you’ll find that it’s much easier to hold their attention. Check out the chart below for an example of how to present uncommon knowledge that may surprise the reader. 4) DON’T: Use boring titles that tell everything in the first sentence. In the image below, the headline leaves nothing to the imagination. The main argument of this chart is known to most people. That said, why would they want to read more? Instead, focus on creating an enticing headline that leads with the promise of new, valuable information. 5) DO: Use concrete visual metaphors. Show data to support your point. Detailed, data-driven arguments convince the reader faster and are much more likely to be remembered, recognised, and shared. The chart below visualizes the most popular pets in the US in a very clear way: Dogs make up 37%. Cats make up 31%, and so on. Thanks to the use of the animal icons and shading, it’s easy to understand this sequence with just a quick glance. 6) DON’T: Use weird formatting to visualize data. Be careful with funky data visualization formats, as they’re not as easy to read as traditional formats. While the following chart is certainly creative, we’d argue that a simple bar chart would convey the information in a way that makes more sense to everyone. 7) DO: Make your message believable. Make your message believable by using customer quotes, testimonials, expert support, and of course, good data. The following quotes from happy customers serve as a great example of how social proof lends credibility to the infographic. 8) DON’T: Show dry numbers without context. As we’ve mentioned before, good stories are emotional. In fact, it almost doesn’t matter what emotion your message arouses, as long as it makes them feel something. Data can be used to start conversations and incite curiosity, when used correctly. However, the data in the following chart lacks both emotion and context. This leaves the reader wondering if the sales figures shown should be perceived in a positive or negative light. An effective use of charts and infographics can dramatically improve the performance of your marketing content, as well as the persuasive character of your business presentations. Is My WordPress Website Secure?